CityCar Rentals brings you some of the most exotic cars on hire including the Bentley. Driving a Bentley is a dream come true for every luxury car enthusiast and we would love to help them live this dream. You can hire Bentley Continental Flying Spur for the most reasonable price. 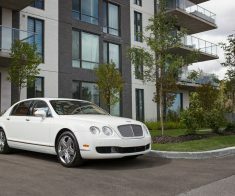 The car features the traditional features of Bentley marquee and will definitely make you stand out as you take it across the streets of Montreal. You can hire it on a weekly as well as monthly basis. It is a four-door luxury sedan which means you can hire it for wedding, outings, date or for special trips across the town. Along with the car, you also get our valet services at your disposal. They will make your life easier, just let us know where you would like to pick up the vehicle from and we will be there for you. For other details or any more queries, kindly get in touch with our support team.